The Grrrls Literary Activism Project enables young women to exercise their voices in the public sphere. The project is inspired by activist foremothers such as the Guerrilla Girls, the New York City-based band of artists whose creative street activism inspired a shift in the way women artists appear in museums and the media. The participants develop their own unique strategies to make their voices heard. In our most recent program period, one group created and wore t-shirts using a poem they wrote in response to a photo from the newspaper or a family album. They also wrote, printed and distributed their own ‘zine, entitled Body Parts. This group’s final project—conceived by them—was to wrap poetry around tampons and sanitary pads and place them into a refurbished tampon machine. They decorated the machine with red velvet and a feather boa; it will be a traveling installation at women’s rooms around the downtown area, starting at Bentley's coffeehouse on Speedway Boulevard in Tucson. The other group did a writing project on dollar bills, which they then returned to circulation (one grrrl wrote Feed Your Greed in jagged letters across her bill), and developed oversized “cootie catchers” containing poetry about the seven deadly sins and left them on tables at Epic Café. The program has even attracted media attention that resulted in an article and photo in the Arizona Daily Star in February 2007. The Grrrls Literary Activism Project seeks to bring about changes in attitudes and consciousness. The very nature of literary activism is to affect the individual who experiences the publication (i.e. public expression in any form) of an author’s perspective. Whether the individual is a decision-maker or an average citizen, the goal is to open the recipient’s eyes to another point of view. That the author, in this case, is a young woman insisting that her voice be given equal air time, print space or aural opportunity brings another level of importance and power to the act of publication. 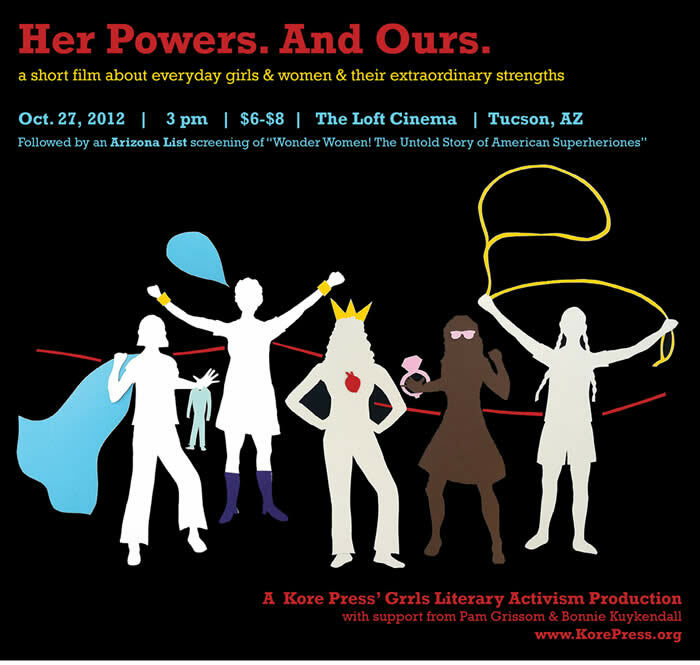 The project serves high school-aged young women in Tucson. Any young woman aged 14 to 18 is welcome to participate, regardless of where or whether she is a student. At least one session is devoted to the process of printing and book production, including layout, design, and bookmaking fundamentals. Each participant has the opportunity to create a poster-sized broadside of a chosen piece of her work and produce a limited edition print run. At the end of the program, Kore Press hosts a voluntary public reading to give the grrrls an opportunity to share their work with family, friends and classmates. This past program period's reading was hosted at Antigone Books on 4th Avenue. In the most recent program period that ended in May 2007, participants started by coming up with their own definitions for “literary” and “activism.” It is important to listen carefully to each participant as she finds and expresses her activism at whatever level and/or strategy works best for her. However, we do not bring participants too quickly to the activism phase of the project. The process of reading others’ work and finding their own voices is critical, and, we think, not to be rushed. The grrrls did writing exercises to reveal how to discover the differences between one’s private self, one’s public self and one’s secret self. We have been moved by their willingness to go deep and share their most personal thoughts. When one girl revealed her most personal secret there was invariably another that said, “That’s my secret, too.” They didn’t just stop there: they were also making the connections between their own experiences and those of humanity.